Marcela Ramirez is used to the limelight. As an author of several cookbooks and a celebrity television chef in her native Mexico, the sweet-natured, natural beauty certainly knows what constitutes great latin food. When her daughter, Andrea, got accepted to attend UBC in 2016, Ramirez also made the move to Canada. 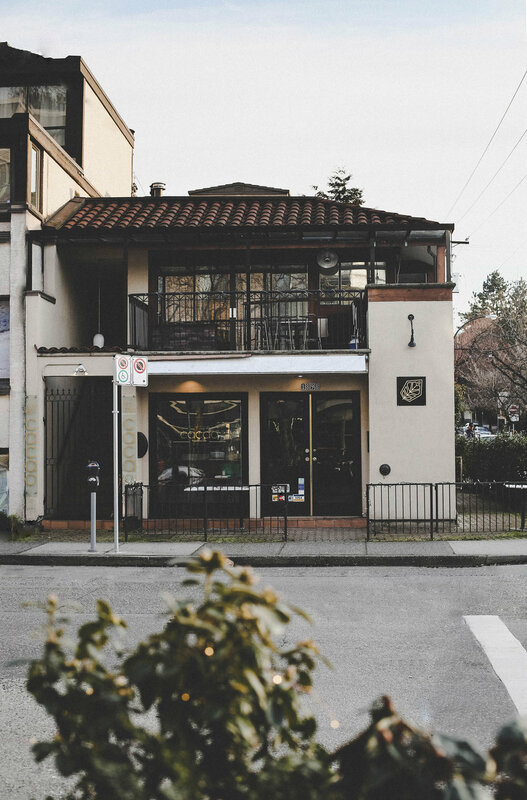 She then purchased the Epicurean Caffe Bistro on West 1st Avenue in Kitsilano, a dated Italian coffee and muffin shop that had been in operation for nearly a quarter century. The Ramirez women operated the delicatessen with insufficient attention, but her tremendous talent for authentic cuisine was not to be wasted. Looking for another route, Ramirez sought the guidance of another latin-forward celebrity chef: the renowned Jefferson Alvarez. Together they got to work on a new concept. Enter Cacao, a progressive south-continent focused restaurant utilizing modern, European culinary techniques to exhibit traditional, time-honoured Latin cuisine. A signed note from chef Juan Mari Arzak of San Sebastian. Jefferson Alvarez holds an empty cacao husk. The cacao beans from inside have been used in his dishes. Alvarez echos Ramirez in his passion for promoting genuine Latin-American cuisine. 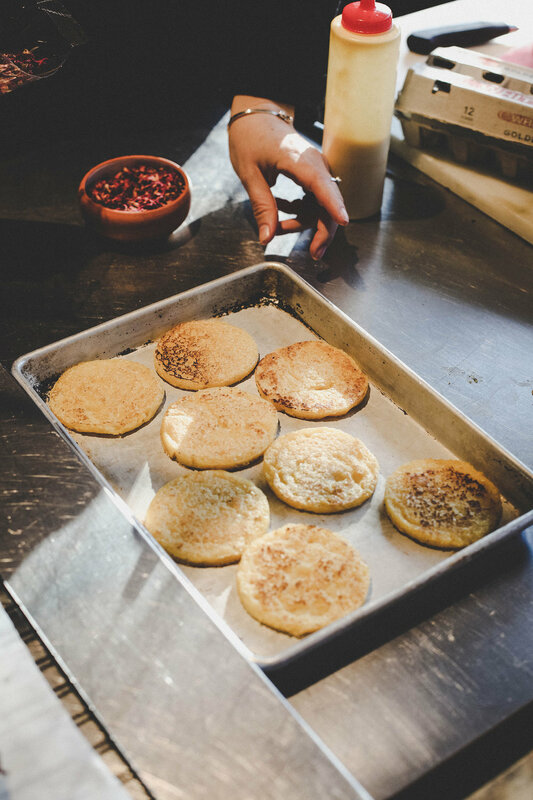 “We’re doing Latin American food, to the bone, with locally-sourced ingredients,” he says. “Yes, we have some ingredients from Venezuela and Peru, that don’t grow up here, but we grow our own South American plants in the garden too.” This includes huacatay (black mint)––a plant species indigenous to Andean Peru where its name is derived from the Quechuan dialect. They both excitedly start elucidating the enchantment of walking through cities like Ramirez’ hometown of Monterrey, Mexico on the day after fresh chilies have been picked and are being ground into salsa by street vendors. The city lanes emit a delectable smell as men and women boil down large batches of tomatoes. It’s part of what fashions true Mexican gastronomy, Ramirez reminisces. The process of drying roses. The petals are used in cocktails and desserts. Venezuelan-style corn Cachapas handmade by Marcela. 'We grow our own huacatay in the garden'. Born in Venezuela, Alvarez was always fond of food and the culinary arts. As a young adult, he found himself traveling to the US and Europe to explore new cuisine. He eventually studied at Ottawa’s Le Cordon Bleu, then went on to work as a chef in Toronto for 15 years and Spain for an additional four years where he trained further under the guidance of many notable European chefs. Romanced by the West Coast’s access to year-round fresh produce, the chef found himself in Vancouver where he’s always focused on local sourcing. After working in a few fine-dining restaurants like Coal Harbour’s Lift and Gastown’s defunct Secret Location which, arguably, have much colder atmospheres, Alvarez yearned for the vibrancy, connection, warmth, and rigor he experienced in Europe. Handmade terracotta jugs filter impurities out of water and keep it at a cool temperature. Chorizo churro with petals; chicken skin with smoked maple syrup and sweet rosebud. “When Marcela and I met [about Cacao], I actually had a one-way ticket to Holland,” Alvarez told me. He had been invited to work at a new restaurant he believed in with a sommelier he admired and a team he was excited about. “But I decided to give Vancouver another chance,” he says with a wink. Marcela and Andrea Ramirez had wanted to consult with someone who knew the industry in Canada a bit more; they no longer felt joy in running the Epicurean and so reached out to Alvarez. Cacao has philosophies that set them vastly apart from the tens of other proclaimed ‘farm-to-table’ restaurants in Vancouver. The kitchen embodies sparse-waste and whole food principles without boasting about it. The entire onion goes into their salsas; strawberry tops and orange peels are used to flavour their house-made vinegar. They utilize the entire animal for different components of different dishes; you’re likely to find a meal preceded with maple-syrup-smoked chicken skin. They serve todo branzino (a whole Mediterranean sea bass) and their Beef Asado (steak cooked over charcoal hailing from the gauchos of Argentina) weighs in at a whole pound. The price point for these dishes is unreasonably low given that Alvarez sources from close friends whose farming and cattle-rearing methodologies he believes in. He visits the farms personally to determine whose meat he wants to bring into his restaurant. “I told my friend Miles, ‘I want to go see your farm’,” he laughs. But then explains more seriously his intention behind experiencing the pastures first-hand. “Until you visit, you don’t know what the animals are eating, how they are living.” He sources wild boar and duck from Hills Food and often visits their partnering acreages in Vernon and Pemberton. Solo chime to settle the room’s energy prior to service. Marcela’s corn tostado with beans, pico de gallo, and feta. Janice Yu from Fresh Ideas supplies Cacao’s kitchen with their fish; a partnership Alvarez and Ramirez are proud of. Yu, whose family have been supplying chefs with fish since she was a small girl, explains that when you purchase fish in a grocery store for example, “chances are that it was caught days ago. In contrast, though, most of [my] products are proudly sourced each day from fishermen that I’ve grown up knowing from a young age.” Boats drop off their day’s catch at Yu’s plant for them to gut and fillet according to her customer’s orders. The Savkovic family’s Cherry Lane Farm currently provides Cacao with squash and potatoes, some of the best for how proximal they are: just a few miles from the big city, over in Richmond. This family-farm is modeled after the small-scale, crop-abundant farms that existed during the pre-war era in their historical Serbia where human hands tend to the soil. Cherry Lane grows without chemicals and uses organic, high-variety crop methods, which the kitchen at Cacao values when considering both flavour and mindful ecology. Coconut and yellowfin tuna ceviche. Cacao isn’t big on greenhouse produce, so in the winter months, they focus more on fermentation. I ask what’s in a large glass container sitting above their kitchen and Alvarez tells me it’s a savory guava, mid-fermentation process. They also make a miso vinegar kombucha for barley and rice dishes. Friends grow their chilies, who then pick and wash them by hand. Since many Latin-American cuisines utilize rose petals, the team at Cacao pick and dry enough to supply them with enough garnish for a wide variety of dishes, well into the winter. My hibiscus margarita had lightly-sweet, pale-pink rose buds dried and sprinkled for a stunning presentation. When I was in last, Alvarez was soaking hibiscus flowers, readying the bar with the beautiful cocktail ingredient. He sources these roselle flowers from Fresh is Best in Kitsilano who bring them in from Doña Elsita. While most restaurants try to book a 6pm seating as well as an 8pm seating to have two covers per night, Cacao is the opposite: They don’t flip tables. “Here, you’ll eat a meal, enjoy it, talk about it, feel comfortable and relaxed. There’s no rush.” He talks of his disdain for places that slam down the bill as soon as you take your last bite. “You’re having a conversation and they throw the check at you. We don’t want to be that.” He prefers guests to sit while they digest their food, ask questions about the cuisine, and simply chat over their last pisco sour—or two. “I’d rather they leave and tell their friends, ‘If you’re looking for a place you can go for a show, enjoy it, and then relax to take it all in, that’s where to go.’ I want intimacy. It costs us money, but we choose that.” You can also book a private room upstairs for celebrations. Chorizo octopus with burnt onion pure, chilli sauce, and cassava crackers. There are two weekly events that make Cacao more community-driven than your typical restaurant. The aforementioned Test Kitchen Tuesday is where the team experiments with new ideas they’ve learned on their travels and through collaborations with other notable chefs. The idea being that at a reduced price (a ridiculously low $65 for the amount of high-value courses they serve at 10 succeeding plates), they open themselves up to critique and question. “Feedback is quite welcome, as some of the favourite dishes make their way into the daily menu.” You’ll taste rare and unique imported fruits that pair with traditional delicacies like foie gras and rich preparations of wild game. Beef Asado (Argentinian-style BBQ steak) and chimichurri. La Bella Christina: coconut milk, house-made almond syrup (orgeat), and kefir lime infused rum. They also just added “Marcela’s Dinner” on Thursday nights where the celebrity chef brings in her own decades-in-the-making creations. She curates the dinner with a starter, an appetizer, an entré, and a dessert which will all showcase the sauces and spices from her southern Mexico roots. An already popular item on the daily menu features Marcela’s 50-year mole. Alvarez enjoys explaining this element to guests who often confuse its pronunciation for the animal. “It’s mol-é!” he says laughing. The sauce is a savoury cacao-, nut-, and chili-based topping that pairs well with meat and has a history dating back to indigenous cultures in Puebla and Oaxaca. The bar where you can watch Alvarez shake margaritas and pour hibiscus syrups into beautiful cocktails. Custard with rose petals, cape gooseberries, passion fruit jelly and passionfruit honeycomb. Beverages at Cacao are uncomplicated yet divine. One that delighted us was the La Bella Christina: a drink with kefir lime infused rum, coconut milk, house-made orgeat, and the traditional egg white foam. They also offer classic margaritas and pisco sours along with a straightforward wine list. “We have two BC wines: one from JOIE, another from Tantalus,” Alvarez tells me. “The rest are European, Argentinian, and Chilean. So our wine list is small but very easy; you can drink anything on it. It’s versatile,” he says, adding with a laugh: “And you don’t have to read an entire book.” They also offer local, craft beers and cider in the summer months when patio season is bustling. Due to the South-West facing terrace, the sun drenches the patio from when they open at 5pm until sunset. Alvarez, Ramirez, and Matthew Gayowski, Chef De Cuisine. Salsa by Marcela; her recipes are passed down from her grand-parents, her father, and her uncle. We were initially drawn into Cacao by its pisco sours. Alvarez tells us on our first visit that Peruvian piscos are much different because of liquor laws here in BC and he therefore couldn’t make them exactly like those found in Lima. But the pisco he made me put a spell on my restaurant compass; It’s a drink we now order every time we come in. Once we tried the beef asado, the yellowfin tuna ceviche, and the chorizo octopus, we were sold on Cacao as a premier restaurant; a leader in sustainable sourcing, an authority on Latin culture, and an innovator in distinctive, artful cuisine.